I originally meant to wait as long as possible to get my California Drivers License and register my motorcycle. I know the rule is that as soon as you are gainfully employed in the state you have 20 days to get a driver’s license and register any vehicles you may be operating in the state. Well I had hoped to bend those rules a little bit not because I'm a rule breaker or a rebel but because I didn't want to have to change the address in a few months once my wife moves here and we get a real place. Well as part of my training for work at PG&E there are a number of driving safety and standards that I need to learn and be signed off on. Last night as I was reading through all the study material (because I'm new to the area and have no life) I read an interesting nugget. It basically said; and I'm paraphrasing, "any employee operating a company vehicle must have a valid California driver’s license. That was enough for me; I needed to get that done. I granted I'm still within the 20-day legal window to take care of it but tomorrow I’m going to be driving to one of the training sessions and being observed as part of my training and I didn't want to leave anything to chance. Sure I'd probably be fine but you never know. If on the off chance someone swerved into me and I had an accident that could be grounds for termination under the auspices of my not following a standard I was trained on. Now, I had went through all the practice tests the California DMV had on their website on one of my last night shifts and remember some of the questions were a bit tricky but heck; I needed to get this done. I went to the DMV and figured I’d do it quick; like pulling off a band-aid. All of the people working at the DMV were super helpful and the wait wasn’t any worse than any other DMV I had been in before so kudos to them for that. I had to take the written test for both the Class-C and Class-M certifications. 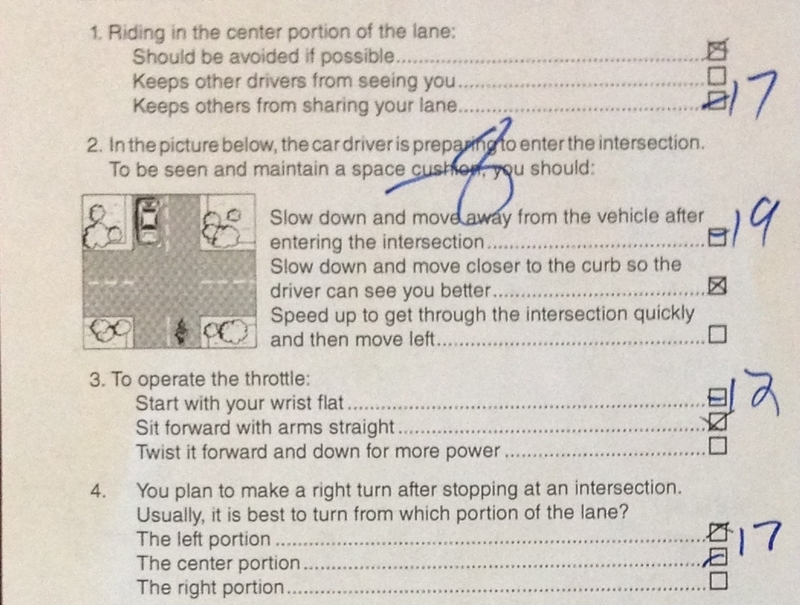 To pass the Class-C general driving test there were 36 questions and you could get 6 wrong. And the Class-M motorcycle test had 25 questions of which you could get 4 wrong and pass. The guy graded the Class-C first and I got all but one right! Awesome! On the Class-M I got the first four wrong and I knew I was fugged because I knew that I had guessed on a few of the other questions and the odds that I would get the rest right were slim to nil. Sure enough, I ended up with 8 wrong answers. 8 WRONG ANSWERS?!? How did I manage not to kill anyone on the way to the DMV!?! The light bulb goes off in my head… I actually remember my MSF instructor telling me that same thing; that old riders have trouble passing the written test. Apparently I’m an OLD rider now. Well my ego was definitely bruised and I humbly asked the guy for a motorcycle handbook and he numbered the questions I had wrong with the pages that explained why their answers were the right ones. Luckily they gave me a temporary license anyhow and I am good to dive a car in California as a licensed California driver but I need to retake the taste to officially have an M-certification on my California License. Also luckily, I still get to operate my motorcycle under my Wisconsin License for now. I dodged a bullet there. To make this a teachable moment I’ll share my wrong answers and you can see my though process as to why I chose the wrong answer. Question 1: I avoid the center of the lane because that is where every car leaks their anti-freeze and oil at which can be dangerous. Question 2: Was just effing vague. Question 3: The way I sit on my FZ the answer I gave fits better. This question could vary depending a lot based on what motorcycle you ride. Question 4: The center portion AGAIN is where every car leaks their anti-freeze and oil at which can be dangerous plus if you are signaling right and turning from the right portion of the lane inevitably a car tries to move next to you. Question 7: I was thinking in terms of sportbikes where most people use the front brake almost exclusively and forget that the rear brake is big component of shortening your stopping distance. Thanks knuckle-draggers. Question 18: Also thinking on terms of sportbikes I always lean into a turn. Question 20: What does it matter so long as you are riding in a staggered formation? From this picture it doesn’t look like there is room to safely pull behind rider A. Question 21: This one I think I just wrong; knowing the correct answer now, that one makes sense. So for what it’s worth that’s my story. If you are an “old rider” moving to a new state you may be best served to read through their motorcycle handbook and just answering the questions the way they want rather than bringing logic into it.